The best outdoor living area projects reflect the values and lifestyles of the homeowners. This was the case with a recent project. 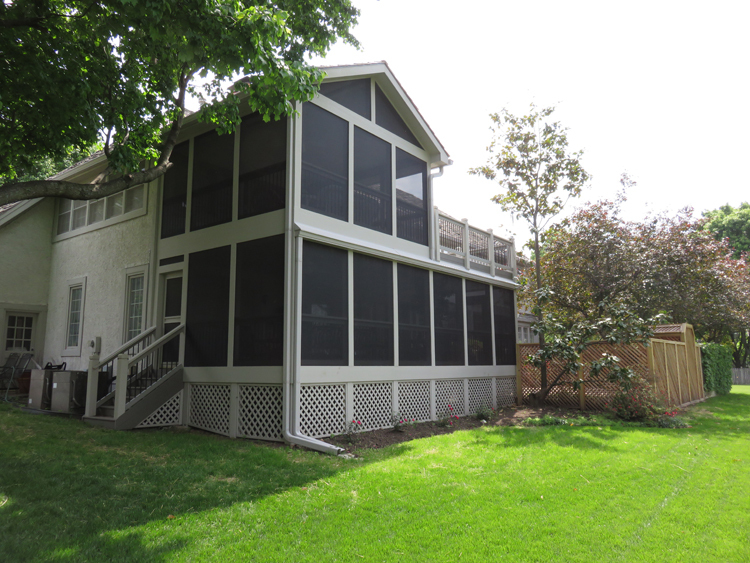 Our clients decided to tackle a huge project: building a dual-level screened in porch and patio. These owners love the fresh air, enjoy being outside and want to bring that feeling into their own living space. This is an addition that has completely changed the character of the property and how they spend their leisure time. This two-story porch in Leawood KS replaced an old two-level cedar deck and bedroom space that had seen better days. The owners wanted to keep the same footprint, but change how the space is used. The new construction is all screened porch on the first floor and a combination of screened porch and deck on the second level. The upper level porch is accessible directly from the second story of the home. 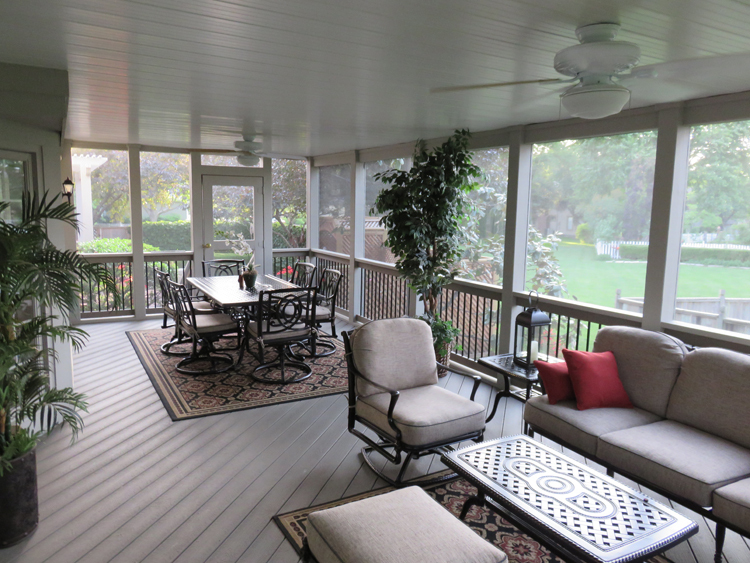 We refer to the connected open area as a balcony deck because it has no other access point than from the screened porch. The lower level porch adjoins the kitchen and has access to the first floor of the house along with the exterior doors and stairs to the yard. Two obvious advantages of having such an extensive screened in living area are the ability to avoid mosquitoes and protection from the elements. We designed a special roof connection and drainage system on the top that not only keep the upper porch dry, but funnel water away from the lower level porch and the balcony deck. This allows the family to use “any porch in a storm.” In addition to the those benefits, the screening adds a great deal of visual privacy from the street. When you look out from the inside, you have a great view of your surroundings. Looking toward the house, you see the screen and some shadows. The porch railings add a level of visual obscurity from the outside, as well as safety. As with all our projects, we gave close consideration to what the best materials would be for this job and for these clients. We used a ceiling called DrySnap which is a vinyl/nylon/stainless steel drainage system. The screening is our ultra heavy duty vinyl screening which is known for wind resistance, long-term durability and for its privacy. We used composite flooring for its strength, low level of maintenance and for the ability to match the color to the existing home–both levels are Evergrain flooring. The railing was created from composite and metal tubes with composite cross connections. Our clients are delighted with their new living space. She calls her upper porch “Southern style” and enjoys the access she has from the master suite. The lower porch is decorated with darker, traditional furniture and it’s just a few steps from kitchen to table. 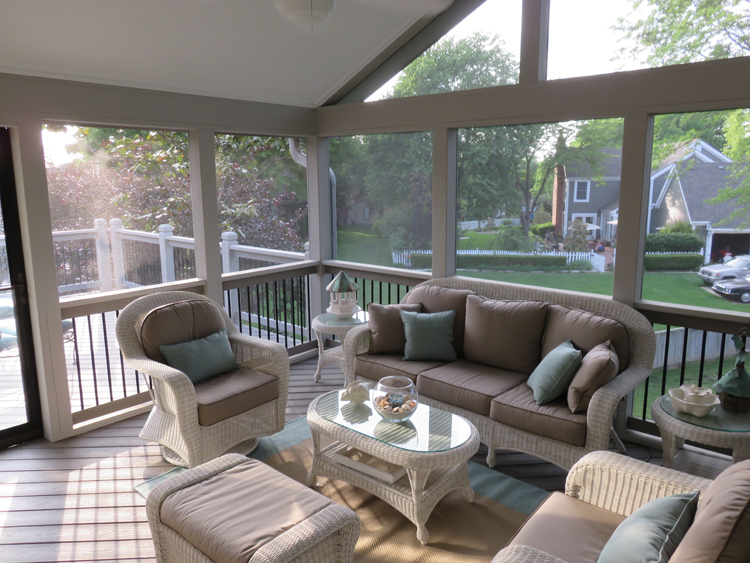 We are so pleased that when they went looking for a Leawood KS porch builder, they chose Archadeck. If you’re considering adding a new deck, porch, or other outdoor living space to your Kansas City area home, give us a call for a free consultation at (913) 851 – 3325 or drop us an email at kansascity@archadeck.net. This entry was posted in porches, Screen Porches on August 11, 2014 by archadeckkansascity.